Short-range order (SRO) in Fe-rich Fe-Cr alloys is investigated by means of atomistic off-lattice Monte Carlo simulations in the semi-grand-canonical ensemble using classical interatomic potentials. The SRO parameter defined by Cowley [Phys. Rev. 77, 669 (1950)] is used to quantify the degree of ordering. In agreement with experiments a strong ordering tendency in the Cr distribution at low Cr concentrations (⪅5%) is observed, as manifested in negative values of the SRO parameters. 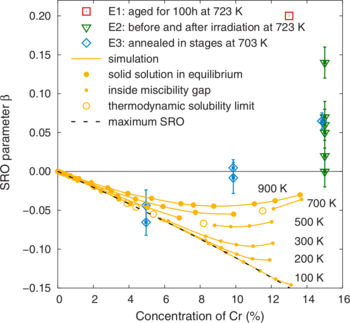 For intermediate Cr concentrations (5%⪅cCr⪅15%), the SRO parameter for the α phase goes through a minimum, but at the solubility limit, the α-phase still displays a rather strong SRO. In thermodynamic equilibrium for concentrations within the two-phase region the SRO parameter measured over the entire sample therefore comprises the contributions from both the α and α[prime] phases. If both of these contributions are taken into account, it is possible to quantitatively reproduce the experimental results and interpret their physical implications. 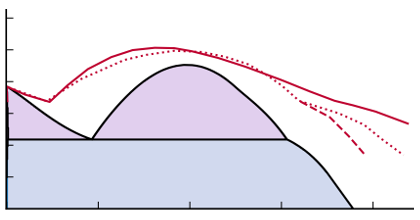 It is thereby shown that the inversion of the SRO observed experimentally is due to the formation of stable (supercritical) α[prime] precipitates. It is not related to the loss of SRO in the α phase or to the presence of unstable (subcritical) Cr precipitates in the α phase.